Summon: Gain 5 magicka this turn. Nix-Ox is a common Agility creature card. It is part of the Houses of Morrowind expansion. 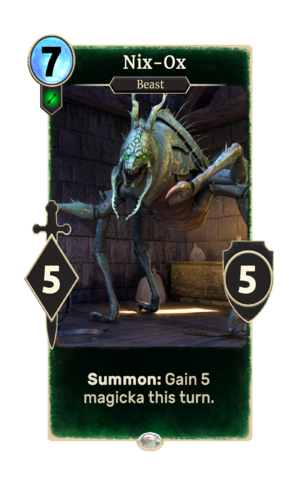 In addition to the card's availability in the Houses of Morrowind expansion, three copies are included in the Dagoth's Might theme deck, and three copies in the Hlaalu Schemes theme deck. Nix-Oxes first appeared in ESO. This page was last modified on 24 September 2018, at 23:05.